Neil “Kew” Jungao and Bryan Lambo look on as authorities conduct an inventory of illegal drugs allegedly sized from them during a drug buy-bust operation in Guiwanon, Baclayon on Tuesday night. Two alleged drug dealers included in the police’s watchlist were arrested for allegedly selling shabu to an undercover cop in Baclayon. 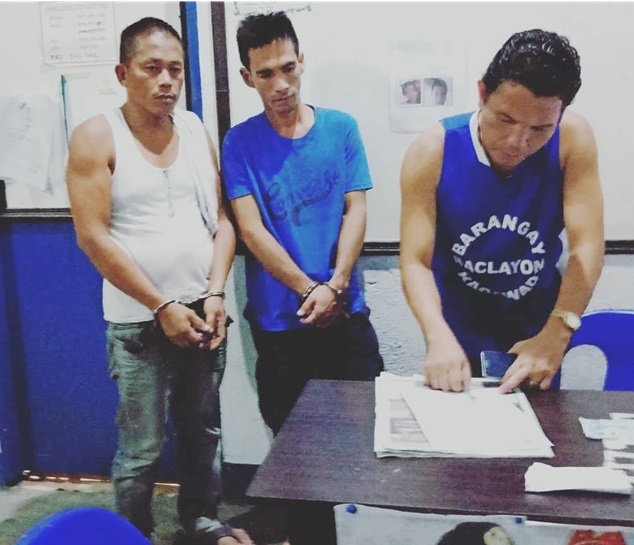 Operatives of the Baclayon Municipal Drug Enforcement Unit apprehended Bryan Lambo, 33, and Neil “Kew” Jungao, 43, both residents of Baclayon, through a drug buy-bust operation on Tuesday night. They were placed under surveillance and on Tuesday night were spotted allegedly selling illegal drugs in Barangay Guiwanon, Baclayon. Police then set up the staged drug transaction against both men. Lambo and Jungao were placed under police custody after they allegedly sold shabu worth P2,000 to a poseur-buyer.